Paula is an icon when it comes to Long Hair and I was lucky enough to put to Paula a few questions and I think it makes for great reading! When and Why did you start hairdressing? I started Hairdressing in 1987, I was 17 years old. I chose hairdressing because it looked so cool and creative. Originally I wanted to be a criminologist because I’m such a people watcher and I find humans so fascinating to try and understand. So really, if you combine the two minus the crime you get hairdresser. How did long hair become your passion? My Mum was a hairdresser, QLD champion in long hair in fact and always did beautiful styling, being as good as my Mum was always my goal. I started focusing on long hair after I realised my whole career I had always loved doing bridal and once joining “The Art of Hair “under Sharon Blain, the dream of being able to do and create beautiful long hair became a reality. Most memorable moment for you personally in the Industry? 2-Being asked to MC the Top Salon Summit at Hair Expo 2017. This was super confronting as it was in front od so many of my revered peers and they were listening to me? How humbling is that! 3-Recieveing a Huuuuugh bunch of flowers from Anthony Whittaker to say thank you for being his technician on tour in Australia. 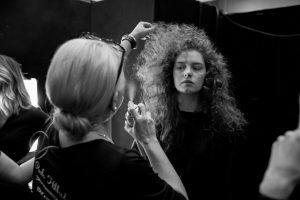 5-Being the Hair Director and mentor for the opening show of the De Lorenzo ASPYA Conference 2016.
Who did/do you admire and how have they influenced you? Firstly Faye Murray for her passion and continued support in and of the industry. She’s just one of those people who makes everything more positive; she is just full of genuine encouragement, down to earth and incredibly approachable. Just an all round fantastic woman. Sharon Blain for her creativity. She is an extremely talented woman and her work is the ultimate cream of the crop for stylists who love up-styling. Benni Tognini and the Tognini family in general. They have always had such amazing passion for the industry and constantly encouraging growth of the people and keeping everyone inspired. And last, but certainly not least, Nicolas Jurnjack because his ability to transform hair is second to none. What would you say to today’s Long Hair Stylist? Don’t be scared of it. preparation, preparation, preparation. Preparation is the key to beautiful finished style. And then once you’re done, practise, practise practise ! Finally where do you see long Hair going in 2019? 2019 long hair is getting bigger and braids are still our fried. The possibilities are endless and have fun with the revival of the 70’s and 80’hair because its definitely back!